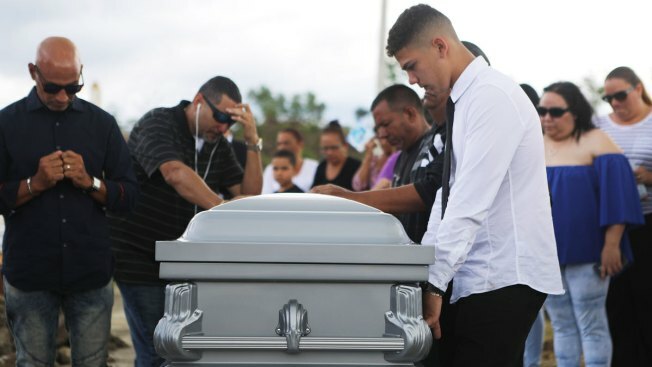 In this October 14, 2017 file photo, mourners gather with the casket in Hormigueros, Puerto Rico. The pace of deaths quickened on Puerto Rico immediately after Hurricane Maria — well beyond the number of deaths officially attributed to the Category 4 storm. Officials in the U.S. territory on Wednesday reported the island had an average of 82 deaths a day in the two weeks before Maria hit Sept. 20. The average increased to 117 deaths a day through the rest of the month, but the rate then fell below usual in October. "The truth is, that's not normal," said Jose Lopez Rodriguez, a demographer with the island's Demographic Register. "We saw a difference, and it was a significant difference." 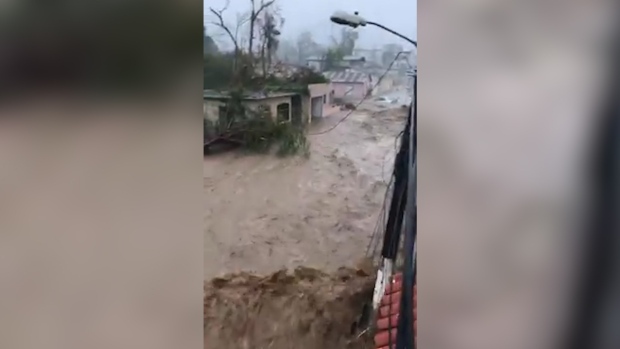 The territory's government has said 55 people died during the hurricane or later as a direct result of the storm, which knocked out power across the island. NBC 6 meteorologist Ryan Phillips takes a look at the peak wind gusts measured in Puerto Rico from Hurricane Maria. The overall daily death figures hint that the storm could have caused other, harder-to-detect fatalities as well, though officials at the government's forensic institute said they did not have evidence to attribute them to Maria. They also rejected some media reports that suggested hundreds of people had died as a direct result of the hurricane. "Those figures of 200, 400, 1,000 — no. Those deaths have not been reported to the institute," said Edwin Crespo, director of the island's Bureau of Forensic Science. "The institute has no reason to hide bodies." Crespo said death certificates sent to his agency involving natural deaths didn't state whether a lack of power could have been a factor. "If the hospital or doctor didn't make the connection," he said, then paused before adding: "We weren't there." Hector Pesquera, secretary of Puerto Rico's Department of Public Safety, acknowledged that some deaths classified as natural possibly might have been linked to the hurricane. "Yes, they could have occurred," he said. "We cannot deny that categorically." Wanda Llovet, director of the Demographic Register, said a total of 2,838 deaths were reported for September, a 20 percent increase from the 2,366 deaths reported for the same month in 2016 and up from 2,242 in September 2015. Hurricane Maria slammed into Puerto Rico on Sept. 20, bringing heavy rains and sustained winds of 140 mph. But, she said, the number of deaths last month totaled 2,119, which was down about 10 percent from 2,353 in October 2016 and 2,379 in October 2015. Pesquera said the government does not plan to investigate whether any deaths should have been classified as having a link to the hurricane. "Why would there be an investigation?" he asked, saying a doctor would not risk losing his license by signing an erroneous death certificate.